Saturday, we went to the annual Sparkleberry Country Fair. We had planned to stay for about an hour, but had so much fun that we ended up staying for close to 4 hours! They had horse-drawn wagon and carriage rides, so we did that first. It was so relaxing! It almost made me want to sell our car and move to Amish country. 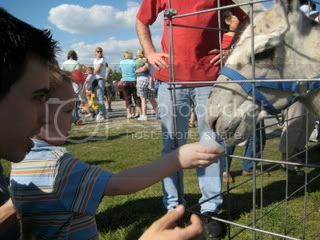 There was a petting zoo/barn that Caleb really seemed to enjoy. There were a lot of rabbits. They had a breed chart posted as well. 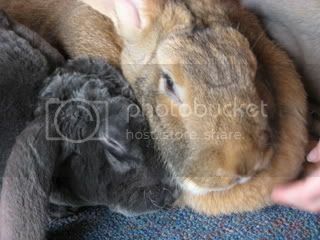 I had no idea there were so many breeds of rabbits! 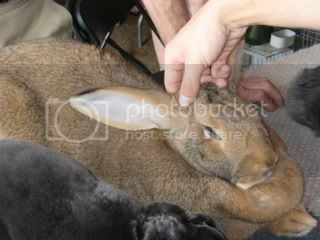 This rabbit was huge! The pictures don't do it justice. He weighed 23 lbs! 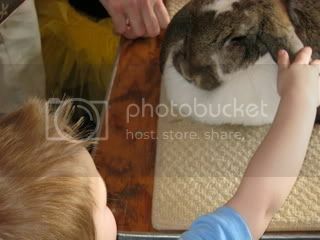 He was a German Giant rabbit, which happens to be the largest breed of rabbit (seriously, that breed chart was great). 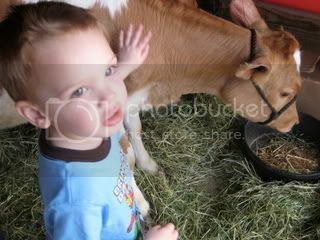 Caleb loved petting all of the barnyard animals, and, yes, there was tons of hand sanitizer available! 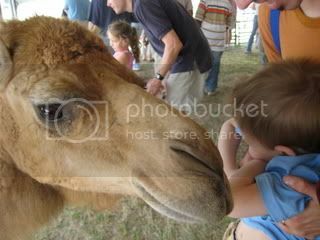 The fair also had an exotic petting zoo this year that was really neat! 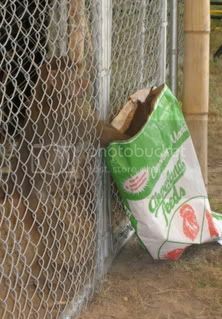 In addition to an alpaca, baboons, macaws, and camels, there were also several animals that I'd never seen in person: two coatimundis, a watusi, a yak, and a binturong (bearcat). Very cool! 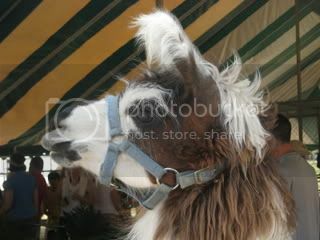 The alpaca...I was totally feeling that bad hair day! 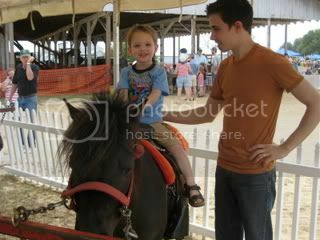 Then, of course, there was Caleb's favorite thing... pony rides! Again! 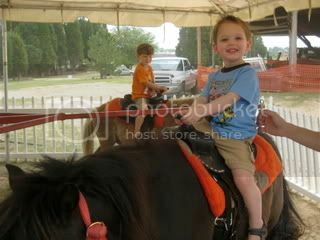 Two pony rides in one week. I hope he doesn't start to think this is a weekend tradition! 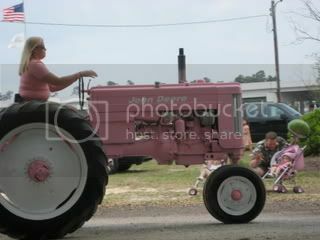 There was a short parade which basically consisted of tractor after tractor after tractor (gotta love SC). Before leaving, we promised Caleb that we would ride the wagons one more time. 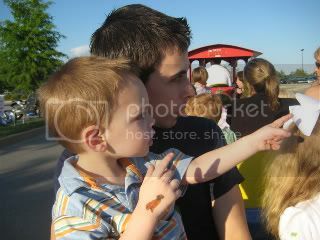 Our first ride was in a wagon, but we rode in a carriage the second time. 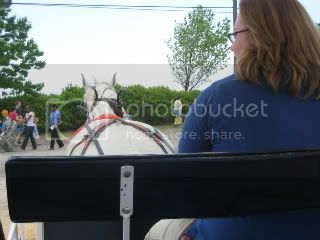 Our driver was really nice, and she told us a lot about the horses that pull the carriages. Our particular horse was a beautiful, 2500 lb. Percheron named Sir Lancelot. 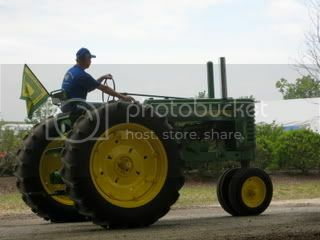 She said that all of their draft horses have to pass a driving test in order to be able to drive on a road. Apparently, they can learn to recognize street signs and traffic signals! Isn't that amazing? Wish we could have stayed all day! 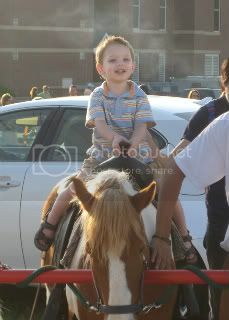 On Sunday, we took Caleb to Funday Sunday at Shandon Baptist. As most of you know, Caleb had a negative experience with the nursery at Shandon and, as a result, has a complete meltdown when we go anywhere near the church (including just getting off on that exit). We decided to go to their festival in the hopes of creating a positive association with the church. Thankfully, he fell asleep in the car, so we were able to drive the normal route. We parked in a different parking lot and made sure we had a pretty good view of the events, so he'd be immediately distracted. It worked! 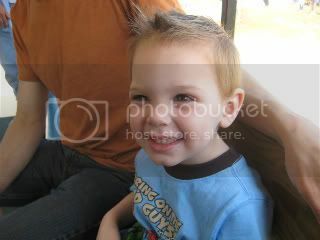 Caleb had such a good time! 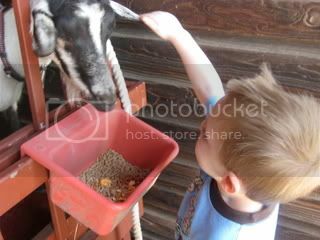 He got to feed a llama. 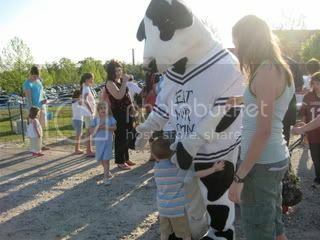 He got a hug from the Chick-Fil-A cow. 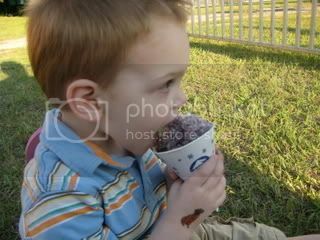 He tried his first snow cone (although, he basically just drank the syrup). 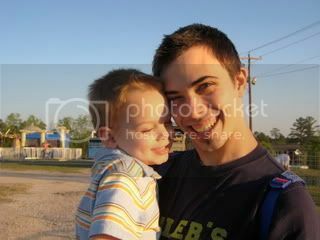 Caleb really loved watching the other kids ride on the swings. 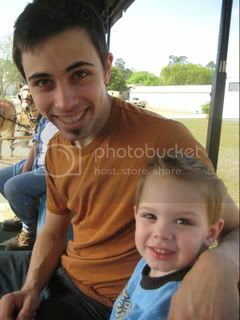 Mommy isn't quite ready for Caleb to ride rides yet, but, luckily, he was content just to watch. 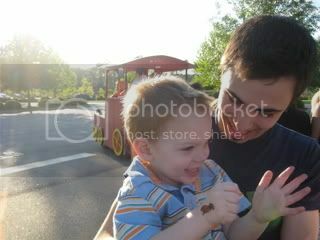 They also had train rides, so, of course, we had to ride. 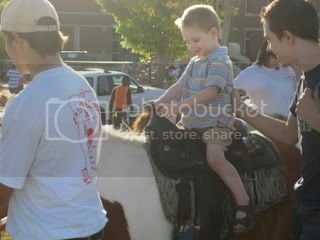 The highlight of the day, however, was Caleb getting to ride a pony. He absolutely adored this! I have never seen him look so in awe and content. Very sweet. All in all, it was a very fun day, and now when Caleb hears the name Shandon. he only thinks of ponies! Yay! Three years ago, I was sitting in Dr. Bervine's office bawling my eyes out, after receiving the news that Baby Caleb would be arriving nearly a month early. 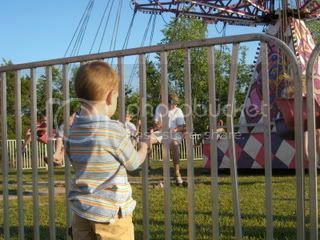 The tears were a result of a combination of fear for Caleb's and my health, my out-of-control hormones, the realization that motherhood, at this point, really was inevitable, and a general feeling of lack of preparedness. Not to mention I was going to miss my own baby shower! I remember saying over and over again, "I'm not ready. I'm not ready." But, ready or not, here he came! After losing a heartbeat and scaring the begeezes out of me and Isaac, there he was. I got to see him for only a moment before they whisked him away, but, in that moment, our eyes connected and I fell in love more deeply than I ever thought imaginable. Three years ago, I could never have envisioned that this tiny, 5 lb. 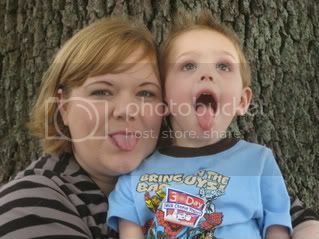 baby, that still slightly resembled a fetus, would grow into such a loving, smart and adorable little boy. 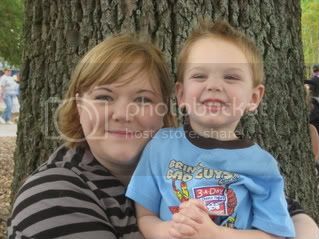 Isaac and I are truly blessed. Because my previous blog entries were sparse at best, I have decided to delete all previous entries and start anew. I had intentions of blogging tonight, but have gotten a late start, so I won't be diving into the blogging pool just yet. 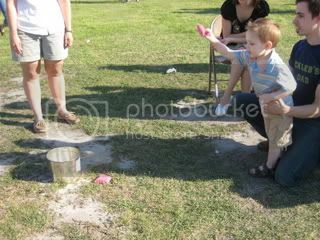 Rest assured, however, that I'll be making a splash tomorrow with a new blog about Caleb's birthday. (Can you tell I'm ready for summer?!) For now, enjoy the slideshows at the left and my new Larry King-inspired layout.